With the common name of Shrimp Plant, Justicia brandegeeana is the botanical name for this shrub from Mexico and nearby areas. The name Shrimp Plant comes from the appearance of the flowers, especially the pink ones which are said to look like the crustaceans that are named after. This is a plant that has been grown for many years and is found in older gardens. It will grow in full sun, however other conditions may suit it a little better. These are a shade loving plant, and flowers come in a number of colours including yellow as well as the more common pink. Commonly grown as potted indoor plants, they will grow well outdoors in warmer climates. Flowering period is long, and if they are pruned back after the first flush of flowers will bloom again in around 4 – 6 weeks. 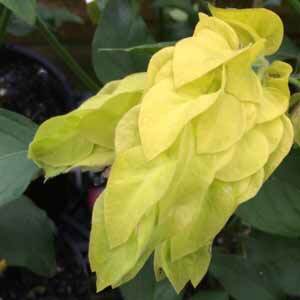 Pictured right is Justicia brandegeeana ‘lutea’ with its yellow flowers is in our mind the nicer of the two forms. These plants thrive in Sydney and further north, and yes they will grow as far south as Melbourne given a warm position. Shrimp Plant Care and growing conditions. Best suited to warmer climates, Justicia brandegeeana will grow well in cooler area of Australia in a protected position. This is a frost tender plant and is often grown as an indoor plant. A position on a patio with plenty of filtered light and some warmth will do nicely. In the warmer climates these wonderful flowering plants can be grown outdoors. In deep shade the Shrimp plant tend to get very leggy in growth and flowering can be limited, the balance between shade and sun is the key to happy bushy flowering plants. Watering is the other key, a deep soaking twice a week will generally keep the plant growing well, more often in very dry hot summers. Pruning on a regular basis will help keep the plants bushy. Early in spring is a good time to prune them back a little harder to keep them even more compact. Prune away any thin spindly growth from the base at any time. Hard prune back to the basal growth at the end of winter. Mulch well to maintain a cool root run. Easy to propagate from cuttings, when taken from late spring through to late summer the cuttings seem to strike fairly easily although a hormone powder can hasten root formation. 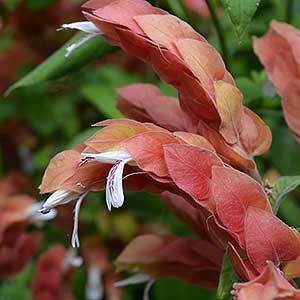 Justica brandegeeana or Shrimp Plant, is readily available for sale during the summer months.